While most of the mines in the park have been sealed by the National Park Service for the public’s protection, some of the mines in the more remote areas of the park can be found and explored by intrepid visitors. Such exploration is not for the faint-hearted: as the above sign states, abandoned mines carry a plethora of hazards. If those physical dangers aren’t enough of a deterrent, the Panamint Range of the park is rumored to harbor a series of large underground caverns containing strange creatures and even stranger relics. If you are interested in exploring a Death Valley mines safely, or just seeing an open Death Valley mine, despite the above listed hazards, the easiest mine to see in the backcountry is Shorty’s Mine. Last Friday (3/7/14), I went back into Arizona to meet up with two of my In Ice Axe We Trust co-hosts, @jestheccc and @moosefish to climb Humphreys Peak in winter. As Jes has done an excellent job discussing the backstory to the climb on her blog, I’m going to stick to just the facts relating to the climb, and the conditions. In short, the most difficult part of this climb was finding the snow and ice, as there was none to climb upon for several weeks prior. As I’ve discussed before on my blog, California is experiencing an extreme drought this year; and these conditions have extended into Arizona. Fortunately for us, the week before the climb, both Arizona and California received a number of small storms that did drop some snow in the higher elevations. While the storm totals weren’t as high as everyone would have hoped, they were enough to cover Humphreys with snow down past the standard Humphreys Peak Trailhead at the Arizona Snowbowl (elevation 9,200). Bad. 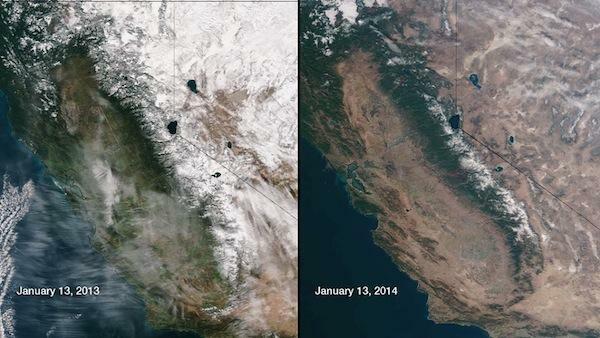 That is the state of California’s mountain snowpack as of today, January 20, 2014. In fact, bad probably is an understatement. A more accurate descriptor might be “awful” or “horrible”. You may think I’m exaggerating – but I’m not. One of the things that’s been lost in the winter of 2013-2014 among “polar vortexes” and wind chill is the simple fact that in California, winter has ceased to exist. While California has always popularly been known as the land of Endless Summer, it used to have seasons. While our seasons were milder than say, Pennsylvania, the state did have them – but not this year. In cases like this, I find a picture is worth a thousand words. If you look down, you’ll see the picture that Governor Brown featured in his press conference from the National Oceanographic and Atmospheric Institution regarding the conditions from 2013 to 2014. On the left, you can see the snowpack as it was in 2013 – a drought year, but a more “normal” year than 2014. On the right, you can see the snowpack as it stands now. Again, keep in mind that California is a state that should have winter. California is also a state that should most definitely have snow above 8,000 feet during the winter months – and yet it does not this year. In Yosemite, the Badger Pass ski area is closed, because there is not enough snow. On Mt. Shasta, rescue crews had to aid two climbers on one of the more popular routes of the mountain, because, among other things, the route did not have enough snow. And, on Mt. San Jacinto, there is no snow at all. The cause of the worst winter in recorded history since 1890 is a “blocking high” – a high pressure dome which diverts storms from the state during the state’s wettest months. But this blocking high is part of a larger problem in California, which is a persistent multi-year drought. As a mountaineer, I’ve observed the climate change over the last five years in our tallest spots. I’ve watched the glaciers recede on Mount Shasta over a ten year period. I’ve also watched the Sierras progressively receive less and less snow during the recent years. In 2010, I climbed Mt. Whitney on the summer solstice under bluebird conditions with snow and ice. In 2011, I climbed Mt. Whitney a week earlier, only to find that it has less snow than 2010. In 2012, I again climbed Mt. Whitney a week earlier – to find that it had no snow. In 2013, when I went to Mt. Whitney in mid-April, most of the snow was melting off. This year, the mountain by and large has little to no snow. Think about that for a second: the highest point in the continental United States has little to no snow in wintertime. I could provide even more examples, and in some cases, even more pictures of what I’ve seen in California’s mountains over the last ten to fifteen years, but there’s no point in providing them here. Either I’ve convinced you – or you were already convinced that climate change is occurring; or either I’ve not convinced you – and you never were convinced that such a thing exists. For me, I am convinced – and I have been convinced for a long time, based on what I’ve seen that the climate is changing. If you don’t agree with me, I will paraphrase Voltaire and state that I agree with your right to disagree. What I will also say is this: even if you don’t believe in climate change, it’s already affecting you – especially if you live in California, from water use regulations, to wilderness use regulations, and expanded and unprecedented wildfire seasons and durations. (More info on the drought here, here, and here). As for what the future holds, no one – including myself knows. But what is clear in the present is that 2014 will likely be one of the worst – if not the worst mountaineering season in terms of winter conditions. In most areas, climbers will not need ice axes or crampons. What climbers will need, however, is good real time knowledge of conditions as they are now, not as they have been for years. This is something I discussed with @thepeakseeker and @mikburtula on the last episode of IIAWT, and it is something that all potential climbers should be aware of; especially on such iconic routes as the Mountaineer’s Route on Mt. Whitney, or the Avalanche Gulch route on Mt. Shasta, because it is clear that without fresh or new snow, these routes, along with others, may be impassable. In such times of drought and change, more than ever the axiom “be prepared” is and will be particularly applicable; and until it happens, let us all pray for snow, because winter is more than overdue. And, If you're scientifically inclined, you can check out the day to day water reports from DWR here. The Last Adventurer continues his training videos with a segment about using all of the skills that have already been discussed - core strength, acclimatization, mountaineering, hiking, and routefinding, and discusses how all of these skills will come into play on the mountain. The Last Adventurer continues his series of training videos about Denali and follows up on a theme of In Ice Axe We Trust - building core strength with a piece of equipment known as the "Backpack of Pain"; an extremely loaded backpack.